KHUSHBOO-A5 is a ready to use product and has a pleasant fragrance It deodorizes guest rooms, banquet halls, homes, offices rooms and theatres. 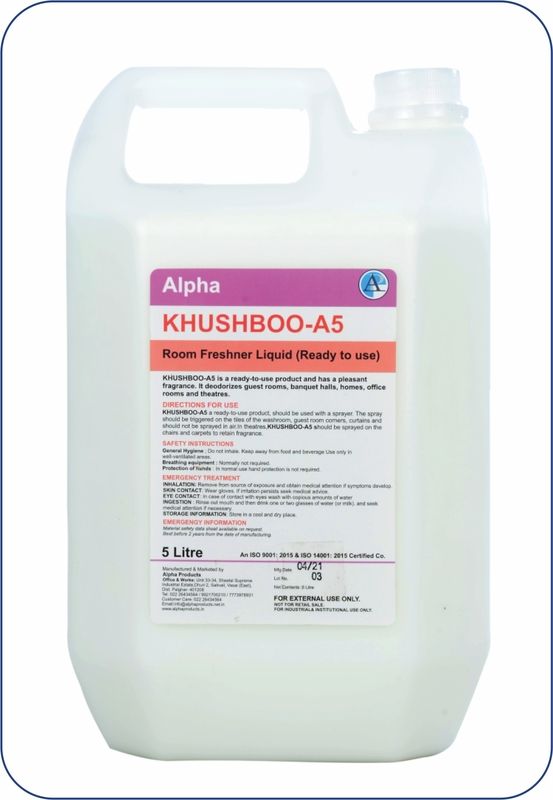 Khushboo-A5 a ready to use product should be used with a sprayer. The spray should be triggered on the tiles of the wash rooms, guest room corners, curtains and should not be sprayed in air. In theatres, Khushboo-A5 should be sprayed on the chairs and carpets to retain fragrance. Do not spray on furniture or polished surfaces. ln case of contact with eyes rinse immediately with plenty of water and seek medical advice.